Do your children squirm and protest when it’s time to visit your dentist in Washington, DC, for their cleanings and checkups? Kids generally don’t like to sit still anyway, and they might hate the idea of having a stranger poke around in their mouth — especially if they might get lectured about proper oral hygiene habits. One of the best things you can do to help alleviate your children’s fear of the dentist is to take care of your own oral health. Here’s how you can make dental care a more positive experience for the entire family. Therefore, it’s important that you’re diligent about visiting your dental care provider at least twice a year to get your own pearly whites taken care of. You could even try to schedule appointments for your entire family on one day. Everyone can make a team effort to care for their gorgeous smiles. What if you have some anxiety about climbing into that big chair? Try not to let your young children sense that; fear is contagious, and you shouldn’t let anxiety get in the way of oral health. Ask your dentist lots of questions. If your dental care provider recommends that you have a certain procedure, don’t panic. You might have misconceptions about what exactly is involved in the treatment. It could be much easier than you expect, and your dentist will be eager to make you as comfortable as possible while you’re getting your teeth worked on. Reward the family. 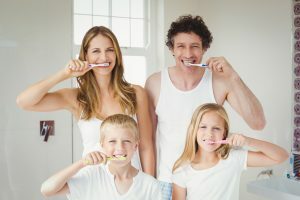 After everyone in the family gets their teeth cleaned, do something enjoyable together as a family (preferably something that doesn’t involve sugary treats). You might visit a local museum or wander around the National Zoo. Don’t worry about money. Some dental treatments come with a significant cost, but you won’t have to stress about paying for them if you plan ahead. You might set up a health savings account, look into dental discount plans, and ask your employer if you can get dental benefits. Many dental offices accept credit as well. You want your little ones to have healthy teeth for life, so be sure to set a good example for them in the way you view your own dental care. Dr. Yelena Obholz is your skilled, caring dentist in Washington, DC. She offers general dentistry services for the whole family, so if you or your little ones are due for a checkup or have questions about oral healthcare, contact our office at 202-364-8989.